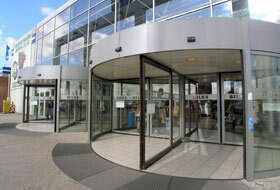 The central pillar of the Classic (CL) large revolving door is stronger than that of the CLASSIC small and is made from steel. It has an integral break-out system and is ideal for larger door diameters. display case: can be illuminated and also upgrades the entrance from its position in the centre of the revolving door.